One of the best-reviewed sequels of all time, TOY STORY 2 continues the tale of the toys from Andy’s room, adding a few characters, upping the chase ante and breaking our hearts with animated toys that are better actors than people. Woody turns out to be a collector’s item, completing Woody’s Roundup Gang, comprising Jessie the Cowgirl (Joan Cusack), Stinky Pete the Prospector (Kelsey Grammer) and Woody’s trusty steed, Bullseye; all awaiting shipment to a museum in Japan, making big bucks for Al. All the principals return to voice their now beloved toys: Don Rickles as cantankerous Mr. Potato Head, Jim Varney as pragmatic Slinky Dog, Wallace Shawn as twitchy Rex Dinosaur, John Ratzenberger as impatient Hamm the Piggy Bank. And the three little green aliens find a new god in Mr. Potato Head and make “oooo” sounds at him. In their quest, the toys enter Al’s toy store and separate, searching for Woody. They meet Tour Guide Barbie, who joins their quest, while Buzz’s nemesis, the Evil Emperor Zurg, stalks them, and is involved in the funniest STAR WARS joke since George Lucas cast Hayden Christensen as Darth Vader. It’s ironic that the TOY STORY movies are the best feature film work of Tim Allen’s career, as he imbues Buzz with such vibrant personality and imbues his human roles with the personality of a puppet. Like the original TOY STORY (1995), Pixar Studios and the genius writers-directors (John Lasseter, Ash Brannon, Lee Unkrich among others) somehow find a way to break off a piece of our hearts, as Jessie recounts the tale of her little girl owner growing up and abandoning her for interests in ponies and boys, all to the strains of Sarah McLoughlin‘s melancholy, nostalgic When She Loved Me. It takes us back to our own childhoods and forgotten toys and carefree feelings and young friends now grown old like ourselves. “You never forget kids like Emily or Andy, but they forget you.” Every 40-year-old man becomes a blubbering baby. It’s embarrassing. 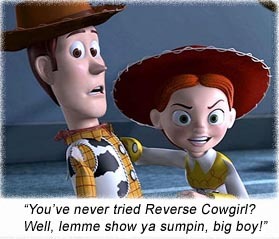 The big question on all our minds: does Woody break off his namesake in Jessie the Cowgirl, who’s a loud, raucous, game lass when it comes to tickling him and enticing him to stay with the Roundup Gang (with Filthy Pete – I mean, Stinky Pete watching out of the corner of his box)? But no – Jessie actually makes puppet eyes at Buzz in the end, leaving Woody to oil his guns on Bo Peep’s bloomers. Now tell that to us weeping 40-year-olds. Directors: John Lasseter, Ash Brannon, Lee Unkrich. Writers: John Lasseter, Ash Brannon, Pete Docter, Andrew Stanton, Rita Hsiao, Doug Chamberlin, Chris Webb. Starring: Tom Hanks, Tim Allen, Jim Varney, R. Lee Ermey, Annie Potts, Joan Cusack, Kelsey Grammer, Don Rickles, Wallace Shawn, John Ratzenberger, Wayne Knight, John Morris, Laurie Metcalf, Estelle Harris, Jodi Benson, Jonathan Harris.